Attending the official grand opening of the Cambridge facility. In the world of luggage, RIMOWA rules the carousel. 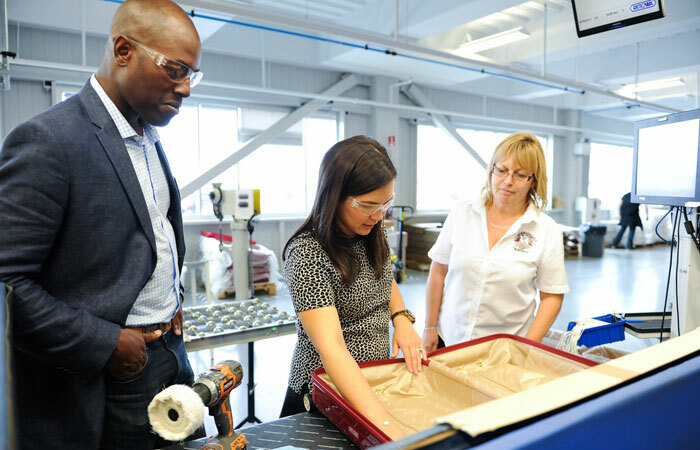 Known for their often-replicated, but never duplicated, grooved aluminum suitcases made famous in the fifties thanks to the jet-setters and flight crew that toted them, today the famed luggage manufacturer is still at the top of their game. 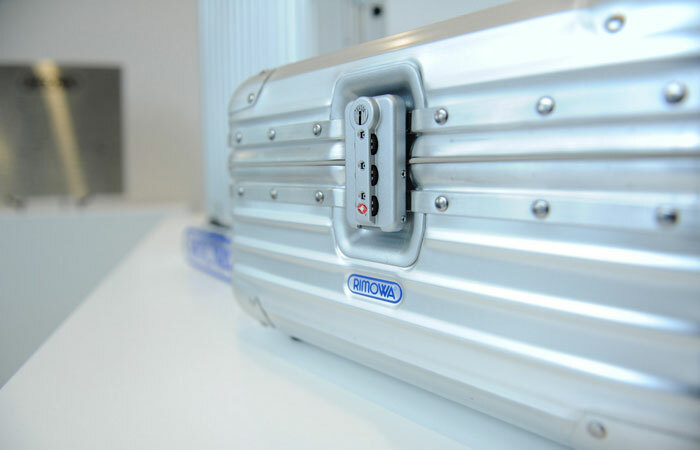 Chances are you’ve spotted RIMOWA luggage in the hands of a celebrity (Gisele Bundchen, Jessica Alba and Michelle Williams are all fans), or even on film, having been used in movies including Girl with the Dragon Tattoo, Air Force One and Transformers. While the luggage manufacturer is headquartered in Germany, they picked Cambridge, Ontario to be their North American headquarters, a town just an hour-and-a-half west of Toronto. 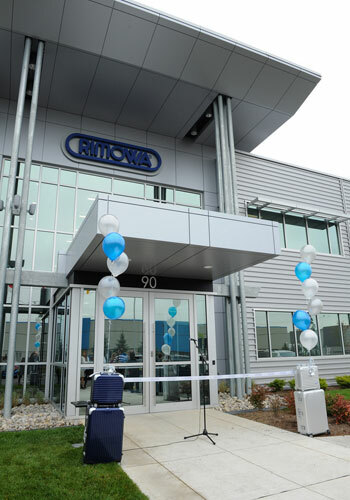 Since opening the first Cambridge plant over five years ago, Carsten Kulcke, Executive Vice President for RIMOWA North America Inc., says they’ve been able to grow their sales 10-fold. 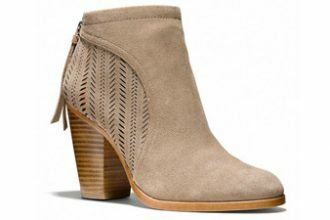 Expanding in this location was a natural evolution for the brand that now has an 80,000 square foot building in the area and also happens to be home to some of the company’s most advanced technology. Carsten Kulcke, Darryl King, Doug Craig and Dieter Morszeck, CEO of RIMOWA, toast after the ribbon cutting. As huge fans of the luggage, we were thrilled to be invited to attend the official grand opening of the expanded facility, which not only brought Mr. Dieter Morszeck, Owner and CEO of RIMOWA GmbH, all the way from Germany, but the mayor of Cambridge, Doug Craig, and tastemakers from Toronto and New York. 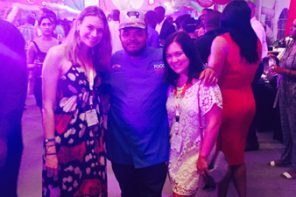 After toasting the ribbon cutting with a glass of champagne, we were given an exclusive factory tour, followed by a hands-on tutorial. The exterior of the RIMOWA North American headquarters. It’s really all about the details with RIMOWA, starting with the building itself. Inspired by the shape of the suitcase and its iconic grooves, the exterior of the facility was designed to mirror the luggage. The lobby area had some cool details too, including three RIMOWA suitcases used in place of the legs of a table. Visitors also get a sneak peek into the production area thanks to the glass wall at the far end of the main floors — although this time we got to go inside! Where the aluminum suitcases are made. The first half of the tour took us to the floor where the aluminum suitcases are built. A much different process than the polycarbonate luggage, we saw how thin pieces of metal were actually cut and the grooves shaped, before they get assembled piece by piece, all by human hands. Unlike what you’d expect a “typical” factory to look like, this facility was open and airy, with quite a bit of natural light flowing in. This area was pretty loud, as it takes more force to add-on every detail. For example, one man’s job is to hammer out any imperfections to ensure the case is perfectly balanced. Our guide Amy jumps on the luggage to show how durable it is. 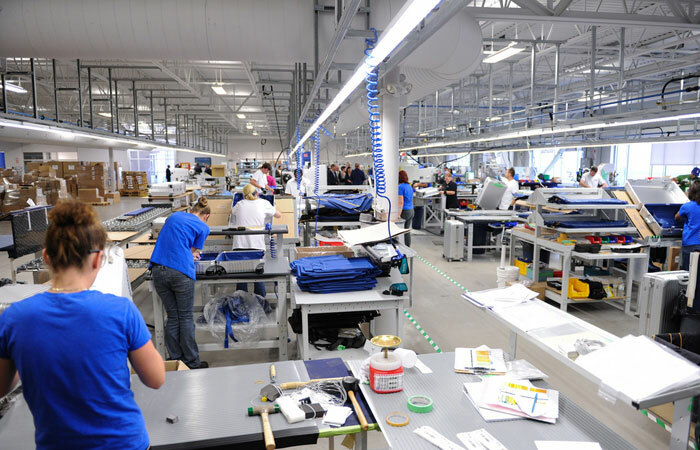 The second half of our tour was on the main floor where the polycarbonate luggage is created. 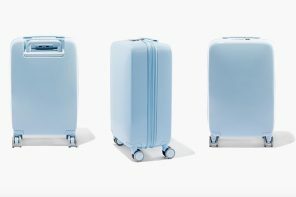 Unlike other polycarbonate luggage on the market, what makes RIMOWA suitcases the best out there is they actually melt down the plastic before it gets turned into flat sheets of plastic, meaning the colour of the plastic is not just coated on, but completely saturated throughout. Plus they also only use virgin polycarbonate, which means it’s stronger and won’t crack during usage. 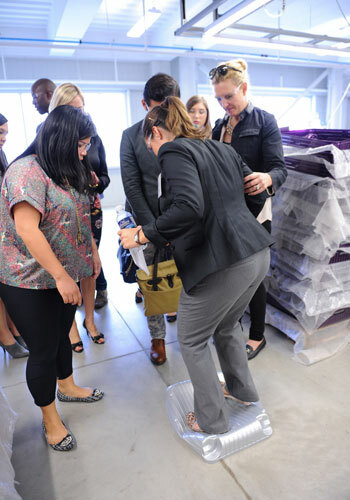 To prove just how durable it is, our tour guide Amy demonstrated by jumping on it. A flawless piece of luggage. During our walk around, we also noticed the wall of “errors.” This is the place where luggage with dents, scratches and any unsellable marks live in shame. Here the pieces have black marker scribbled all over them with words like “No,” and “Scratch” loudly identifying their flaws, truthfully some of which were hard to see with the naked eye. Trying to fasten on a rivet. As if those details weren’t enough, one of the toughest jobs on the floor (if only because I had a chance to try it myself) is the man who sews the zipper onto the shells. He only gets two tries before the shell is garbage, as too many stitches through the polycarbonate will make it too weak to use — so no, not really any pressure. The real challenge is not just the speed of the machine, but holding the luggage at the right angle for the stitches to go through perfectly straight. How the polycarbonate cases are balanced. After it gets its zippers on, the case must be balanced. A temperamental task, sometimes it’s just one or two teeth out of place that adjusts the entire balance. Once this is complete, it’s insides are finalized, including adding in the straps and lock, before it gets a final inspection and buff, where it then makes it way into a sealed plastic bag and box. Going through the final inspection. The entire process made us realize just how much work goes into a single piece of luggage. Surprisingly not much is done by machines, but in fact humans. If we weren’t already impressed by the quality of RIMOWA, this tour certainly sealed the deal. 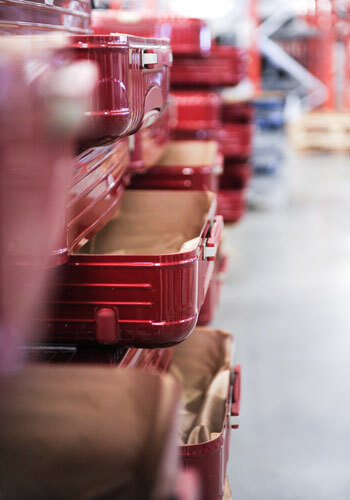 Visit rimowa.de to learn more.